Starry-eyed and ecstatic: that’s how Healthcare Worker, Elaine Barnicoat, described herself after she and her colleagues on Ward 28 at Castle Hill Hospital received a surprise visit this morning. The cardiac ward has been named Hull University Teaching Hospitals NHS Trust’s most festive ward of 2017 and earned themselves temporary custody of the Dr Hermon Cup. Staff were on the verge of tears as the surprise was sprung, and cameras from ITV Calendar and the Hull Daily Mail were there to catch the moment on film. Ward Sister, Liz Robinson, wasn’t on duty this morning, but received a phone call during the visit to pass on the news, and described it as ‘fantastic’. Competition was fierce this year, with numerous wards and departments scoring highly across both Hull Royal Infirmary and Castle Hill, but Ward 28 just pipped their rivals with their giant letters to Santa, Christmas carols performed for patients in both word and sign language, and special gift bags for every patient on Christmas day. Runners up this year were 2016’s winners, Ward 11 (Castle Hill) who turned their domain into Willy Wonka’s chocolate factory, complete with everlasting gobstopper machine and lickable wallpaper. In joint third place were Radiotherapy at the Queen’s Centre (renamed Reindeer Therapy for the festive season) and Ward 6 at Hull Royal Infirmary. The Radiotherapy Team turned Linear Accelerators into reindeer and set up a special festive postbox for patients, while Ward 6 adopted the theme of ‘The Grinch’, by creating a Gastro Grinch for patient education and getting patients involved in making decorations. The Dr Hermon Cup dates back to 1938, when the then-famous radiologist presented the shiny silver trophy to the best decorated ward in the old Anlaby Road Hospital. For reasons unknown, the cup then became ‘lost’ alongside other photos and artefacts in the hospital archive, until it was found last year by Mr Colin Vize, Consultant Ophthalmic Surgeon. The trophy was dusted off, polished up, and used as an incentive for staff to go the extra festive mile for patients. 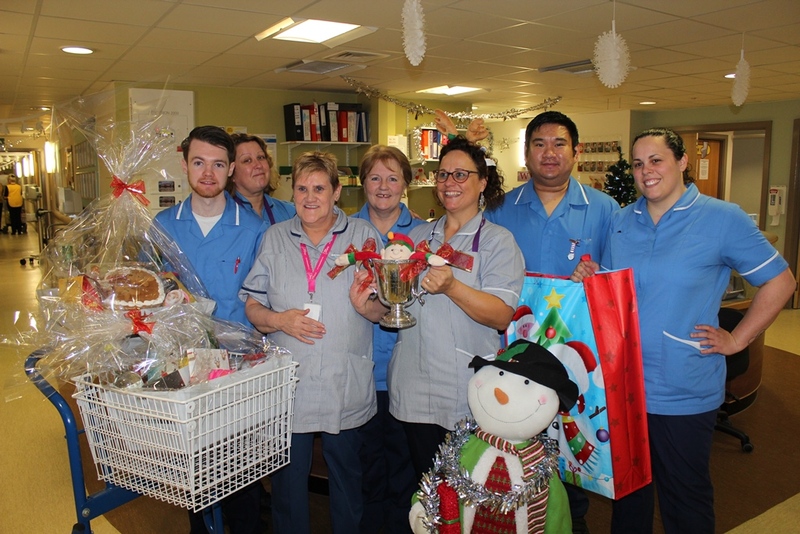 Now in its second year, Hull University Teaching Hospitals NHS Trust’s festive ward competition continues to bring teams together and create festive cheer for patients who find themselves in hospital at Christmastime. “No one wants to be ill in hospital at this time of year, and it can be hard for staff working over Christmas too as they can miss out on valuable time with friends and family. “Our competition is designed as a bit of fun, to bring people together and to raise some smiles among staff, visitors and patients, but it also has other benefits. “We were very clear that we’re looking for more than just decorations; when we were judging, we looked at how else teams have created festive cheer for people and it’s amazing the lengths some teams have gone to. Staff have got patients involved in making decorations, they’ve hosted visits from carol singers, shopped on behalf of patients who aren’t able to do so themselves, and even renamed the radiotherapy machines after Santa’s reindeer.